Welcome to the first round of the Cubs of Yore Battle Royale. Today we kick the tournament off with 4 matches out of the Jose Cardenal Region. There's sure to be some good battles here as top-seeded Keith Moreland comes in with high expectations. Vegas currently has Moreland a 7/2 favorite to win it all. 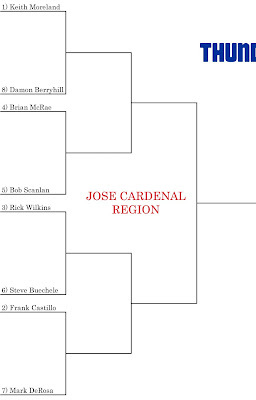 Another battle of note is #2 seed Frank Castillo battling recent ex-Cub Mark DeRosa. Will fan favoritism from last season push the #7 DeRosa to the upset? We'll see. Here's how it'll work. I will outline each matchup, giving the readers a little background about each player. Once you've finished reading, you are then encouraged to vote for your favorite player to win the battle. There is a link in the right sidebar under "Cubs of Yore Battle Royale". Click on that link to load a survey allowing you to vote on all four battles. Feel free to leave comments at the end of the survey as well. The battles will close at 12:01 AM Central on Wednesday. Results will be revealed later that day. Now let's get the battles started. Played with Cubs for 6 years. Acquired by the Cubs from the Phillies in December 1981 along with Dan Larsen and Dickie Noles for pitcher Mike Krukow and cash. Played C, 1B, 3B, LF and RF during his time in Chicago. Once hunted and killed a chupracabra. Led the Cubs in 1985 with 106 RBI. Inducted in the National College Baseball Hall of Fame. Regarding Keith, former teammate Gary Matthews once said, "I don't think I have ever seen a better hitter at the plate when the game is on the line than Keith Moreland." Played with Cubs for 5 years. Drafted by the Cubs in 1984 with the 4th overall pick. Traded to the Braves in 1991 with Mike Bielecki for Yorkis Perez and Turk Wendell. In 1989 was the main player of a scrappy young trio of Cubs catchers including Joe Girardi and Rick Wrona. Has seen every episode of "Moonlighting." Took over the starting catching job from Jody Davis in 1988. Davis held the job since 1982 when he took it from none other than Keith Moreland. Son of All-Star DH Hal McRae. Played with Cubs for 3 years. Acquired from the Royals for Geno Morones and Derek Wallace. Wallace threw in 33 career major league innings. Morones never even got a cup of coffee. Known for his speed, McRae led the '96 Cubs in stolen bases with 37. 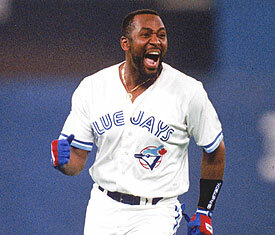 In '95 he stole 27, which was second best on the team behind Skinny Sammy Sosa. Was born with a full five o'clock shadow. Took pain killers while playing in New York, more than likely to deaden the feeling of playing for a worse franchise at the time than the Cubs. Saved 14 games in 1992, the most by anyone on the team that year. Came to the Cubs along with Chuck McElroy in a deal that dumped Mitch Williams to the Phillies in an effort to later crush the souls and spirits of their fans. 2-time state arm wrestling champ. Bob hates batters that swing too hard. Rick Wilkins may not so much be a real person as a myth. A strange being that appeared in 1993 and hit .303 with 30 home runs. When the baseball strike hit, the creature that called himself Rick became disheartened with the game and returned to his mythical homeland. In an effort to make fans believe Rick was still around, the Cubs brought in a lookalike in 1994. But after batting .227, the astute fan deemed this replacement a mere charlatan. Before the truth was found out, the Cubs managed to trade the Fake Rick Wilkins to Houston for Luis Gonzalez and Scott Servais. Hails from Southern California, where 86% of all American-born ballplayers originate. Played with the Cubs for 4 years. The Buechele Era was the longest tenure for a starting Cubs 3B throughout the 1990s. 3-time All-"Big League Hair" selection. Was the Cubs' bounty when they mercifully rid themselves of Danny Jackson. 5/11/2003: The Cardinals were at Wrigley Field and a 23-MPH wind was blowing out to right field. In the bottom of the first, Moises Alou of the Cubs hit a 2-run homer off Brett Tomko to centerfield. In the top of the second, Albert Pujols hit a grand slam to leftfield off Matt Clement. Corey Patterson led off the bottom of the second with a homer to rightfield. In the top of the third, Tino Martinez hit a solo homer to leftfield. Troy O'Leary hit a 2-run homer to leftfield in the bottom of the third. In the top of the fourth, Martinez homered for the second time in the game. This time it went to rightfield and scored 3 runs. In the bottom half of the fourth, Alex Gonzalez hit a 2-run homer to leftfield. He was the last batter faced by Tomko. The game was rained out in the top of the fifth inning. The final count in this day's barrage: seven home runs and a score of 11-9 St. Louis ahead all lost to the weather. Hails from Texas, where 12% of all American-born ballplayers originate. Played with the Cubs for 7 years. Led the league in losses with 16 in 1996. Threw a couple complete game shutouts one season. Nearly had a no-hitter in 1995. Top of the 9th with 2 outs, Bernard Gilkey hit a pop fly that Sammy Sosa nearly caught on a diving attempt. The ball would roll to the wall giving Gilkey a triple. Afterwards Sosa was heard mumbling about finding some special "enhancers" to help him make the catch next time. Is actually still playing baseball. Last season Frank pitched for the York Revolution of the independent Atlantic League. Hails from Valhalla according to some Cubs fans. Played with the Cubs for 2 years. During those 2 years, Mark played 1B, 2B, 3B, SS, LF, RF and was also a part-time referee for Aramis Ramirez's cockfights. Mark was signed as a free agent in by the Cubs after having what at the time was a career year with Texas. He came to the Cubs in a head-scratching signing and left the Cubs in a head-scratching trade. In 2008, Mark was seventh in the NL with 8 sacrifice flys. According to his Baseball Reference similarity scores Mark is most similar to Mike Lamb. Alright, now it's time to hit the polls. You can vote by going to this link, or by clicking on the "Go to Battle" link in the sidebar. *Some of the Fast Facts may not be true. TMS disclaims any accuracy of the facts mentioned.